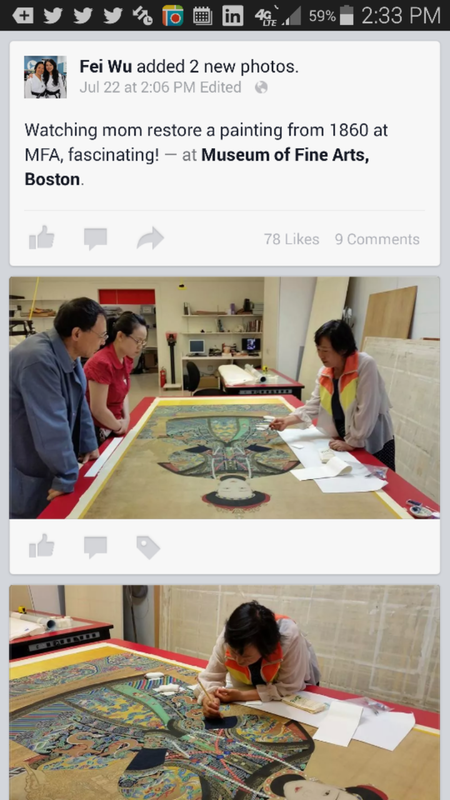 About a month ago, I accompanied my mom Xiang Li to the Museum of Fine Art in Boston to help restore an ancient Chinese painting from the Tsing Dynasty. Earlier that week, mom received a phone call from a colleague (they met at the Forbidden City of Beijing, who now works at the MFA) that the painting needed repair before display. After seeing a few pictures of the issue, mom prepared a little bag of paint, brushes and we were on our way. I’ve never seen her working before and this was the first time. She was laser focused on the painting while everyone else watched. After taking this photo and posted to Facebook, I witnessed dozens of “likes” within minutes. My friends, art enthusiasts or not, began passionately posting comments and giving us the thumbs-up. Mom had not expected anything like this. Restoration, reproduction are seen as rare skills in today’s art world. Very few are trained to do it and to do it well. Wouldn’t it be interesting to share what these subject matter experts posess? People like my mom open up a whole new world for people to witness and engage today. These ultra behind – the – scenes super skills are incredible to experience firdthand. With today’s social media, content strategy platforms, I often wonder about the possibilities of connecting people to the arts beyond galleries, finished works. Art, in the purest sense, truly is a process and not an event.